Try to set the bed temp to 55 and not 60. That helps with greentec/platec. Contrary to what one would guess it sticks better at 55 than at 60 or higher. Also to speed cooling if the print has a lot of hairspray, brims etc. I put the head with the fans on top at full speed (and then add the windowasher drops). This speeds up the heat dissipation from the bed/print, making it easier to remove them. Using this method for speed up, I did actually damage some glasses. But no problem anymore with the Neoceram glass. Ok, will try lowering bed temp to see how it goes. I really would like to skip using glue stick cause it's a pita to remove the prints. nilrog wrote: Ok, will try lowering bed temp to see how it goes. I really would like to skip using glue stick cause it's a pita to remove the prints. Hi all, Hi nilrog ! I solved my Platec bed adhesion issues by using exclusively 3DLAC from Leon3D while following the " Neotko process"
after print just keep patience for the enough cooling, then it will easy to remove. gudo wrote: Hi all, Hi nilrog ! I have now tried two different brands of hairspray...with 60C and 55C bed temp (as reported by the controller). And none of them sticks well enough so the corners always warps slightly...but they come off easy when the bed is cooled down. I also had a sample of Printafix that I received when I ordered some filament. So I gave that a try and it seems to give almost perfect adhesion with 55C and it is still easy to take the printed objects off the build plate. But if you look closely you can see that there is a slight tendency that it has warped. So far the only thing that gives me good enough adhesion is a TESA glue stick...the downside is that it's a P**A to remove the printed objects...even if I try to use window washer fluids. If it wasn't for this issue...this filament is really great and easy to use. 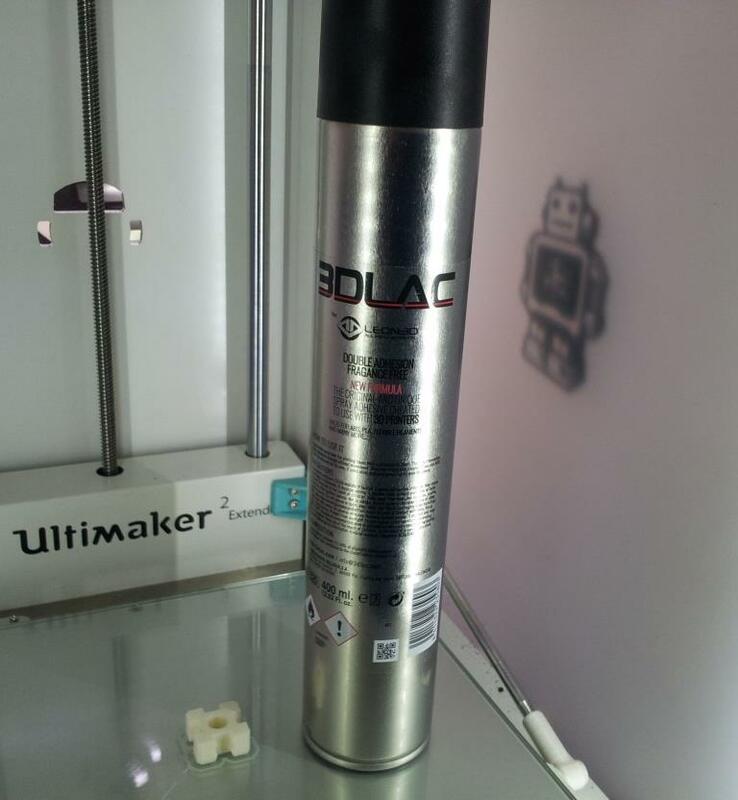 So it seems that I need to either continue searching for some hairspray that works...or give in and buy one of the 3D-printing solutions. Use skirt with 0.20-0.30 separation and use my Skirt trick to reinforce the corners. It will leave a perfect print. Also remove some fan power for slow printa that need highlayer quality. I mean, platec/greentec prints better overhangs since it has a higher glass temp so it cools faster since is easier to move something from 200 to 100C than 200 to 50C (normal pla). So it can do much better overhangs with much less fan. The print shows gaps and under extrusion because I was playing with a s3d option to remove blobs. So yeah, it looks weird. But is a good img of what I mean by brims and custom brim reinforced. I did some tries with brim and it was better...but it still had a tendency to warp. But I have yet to try your trick. Although with a brim I can use a tool to pop the objects off without damaging the objects. So having them stick too much is less of a problem. I have been thinking of reducing the fan speed to see if it makes a difference. Right now I have been using ~30% on layer two and increasing to 50% after a few more layers. But since this is with gudo's fan shroud I have started to think that it might be way too much. Oh that trick looks very promising, I'm going to try that for sure! I'm using the buildtak flexplate. greentec sticks even better than pla. that is also why i would not use the buildtak without the flexplate directly on glass. when i tried earlier, i was not impressed as i never managed to get the prints of the buildtak surface. At the moment, i have a large roll of greentec black, but i have the feeling that it is weaker than platec, especially regarding layeradhesion. anyone else ? I think the stiffness of greentec is slightly less than platec. That's at least the felling I got from Gudo printed prts vs my greentec ones. Even so, after all this month of betas and test both performed equally for the zge. Neotko wrote: Use skirt with 0.20-0.30 separation and use my Skirt trick to reinforce the corners. It will leave a perfect print. Why the separation for the skirt? Doesn't that defeat the purpose? Printed the base for the Labyrinth box in black Greentec. With filament set to 2.85 I need to increase flow to 1.10 because my spool is 2.73-2.75 in diameter. 0.15 layers, 40mm/s, 220C sliced with S3D...only tiny tiny blobs can be seen. Printing the lid in blue Greentec right now. That spool seems to be slightly better...2.80 in diameter. Last edited by nilrog on May 5th, 2017, 2:54 pm, edited 1 time in total.